Oriental Fruit Moth (OFM): The third flight and all required treatment timings are now over throughout the state. Additional treatments will only be required on very late varieties, and only if trap counts exceed 6 moths per trap. We are seeing some high trap captures in some orchards. Tufted Apple Budmoth (TABM): We are in the middle of the second flight, but pest pressure is very low. On most farms treatments are not needed. If you did have feeding injury from the first generation or have high trap counts, then you may wish to observe the following TABM timings. Thrips (flower thrips and western flower thrips): Thrips are present in some ripening varieties, and can be particularly troublesome on nectarines. Delegate (5-6 oz/A), Entrust (6 oz/A) (organic), and Lannate (3 pt of LV or 1 lb of SP) are the suggested controls. Codling Moth (CM): Treatments for the second generation have already been applied. The timing for the 3rd brood is ongoing in southern and northern counties. If trap captures remain above 5 moths per trap, then treatments need to be continued. Also be aware of high populations of Oriental Fruit Moth. Where peaches have been harvested and insecticides are no longer being applied in blocks that are near apples, OFM may be problematic. Fruit Rots: This includes white rot and black rot, but particularly bitter rot. Treatment choices are limited at this time of year, since EBDC’s have long PHI’s, and few people like to use Ferbam (7 day PHI) and Ziram (14 day PHI) because of visible residue issues. Therefore that leaves full rates of Captan either alternated or combined (reduce the Captan rate) with Pristine. Grape Berry Moth (GBM): The timing for the 4th generation treatments is 8/18 in southern counties. This timing is for the use of Intrepid, Altacor, Belt and other diamide mixtures. The timing for the use of other insecticides will be 4-5 days later or about 8/23-25. Spotted Wing Drosophila (SWD): Spotted wing drosophila average trap captures increased over the past week in Atlantic county to 16.5 males/trap, and 11 males/trap in Burlington county. This is not surprising as many growers have stopped treating their fields. The total number of males captured in the traps doubled over the last week to 1011. 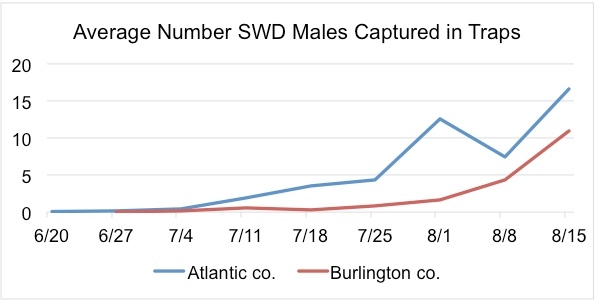 Additionally, this was the first week that we saw 100% of the trap sites in Atlantic county positive with SWD and 91% of the sites positive in Burlington county. Sharp-nosed Leafhopper (SNLH): The SNLH trap counts remained low over the past week (see table); and have not peaked yet. Numbers of SNLH trap captures should continue to increase over the next couple of weeks and treatments should be applied when SNLH populations are higher. Putnam Scale: If you had scale problems during the first generation, and you have not yet treated the second generation, then there is still time to do so. You can use diazinon if you have not already used it this season, or you can use Esteem. Do use plenty of spray volume – ALL WOOD must be covered.